27m/89ft motor yacht VINTAGE was built by Ferretti in 2001 and last updated in 2018. 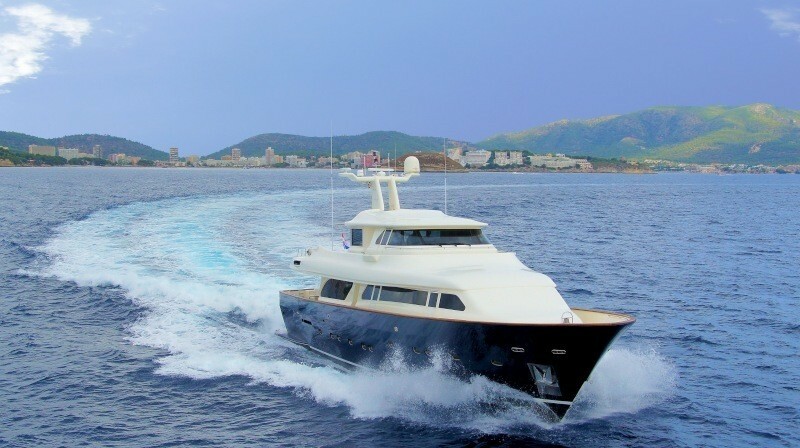 Built with a GRP hull and superstructure, the interiors were completed by the shipyard's in-house team and the accommodation sleeps up to eight guests over four en-suite cabins with a capacity for 12 pax while cruising. The deep swim platform provides plenty of space nest to the water for sunbathing, and after a swim guests can access the main deck aft for a comfortable setting to dine alfresco beneath the upper deck overhang. 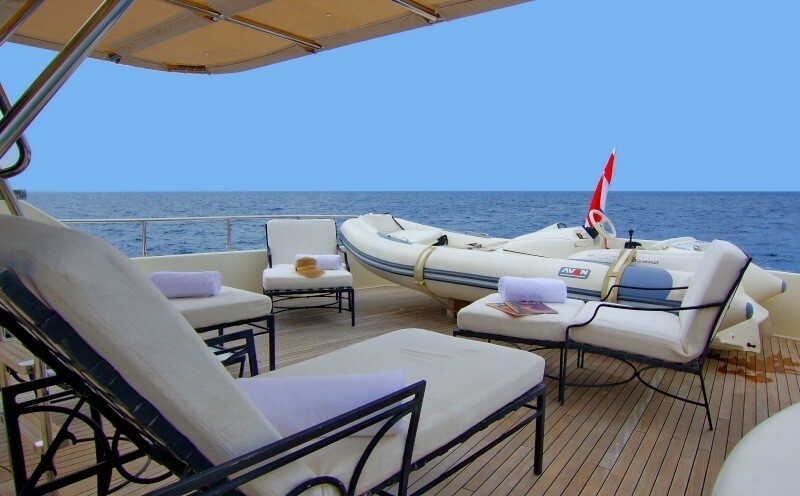 The bow is fitted with additional padded seating for guests to enjoy the sunset, and the upper deck aft has a spread of sun pads for soaking up the sunshine. Two armchairs with footrests and a drinks table are placed beneath the canvas shade and a ladder leads up to the sundeck where there are another extensive sun pad, a barbeque and a more formal alfresco dining setting taking advantage of the elevated views. The interior uses deep wooden panelling and pale furnishings for a timeless and elegant appearance suited to any special occasion. The lower deck contains the tender garage, engine room, guest accommodation and the crew accommodation in the bow. Above, the Master suite is placed on the main deck forward and the interior contains a private lounge, desk and en-suite bathroom with tub. The main deck places two large armchairs with footrests on the raised level in the forward salon, where the ambient environment is the perfect place to rest and catch up on reading. The centre of the salon contains a circular formal dining table to seat four guests, and the walls have an excellent selection of spirits to complement any meal. 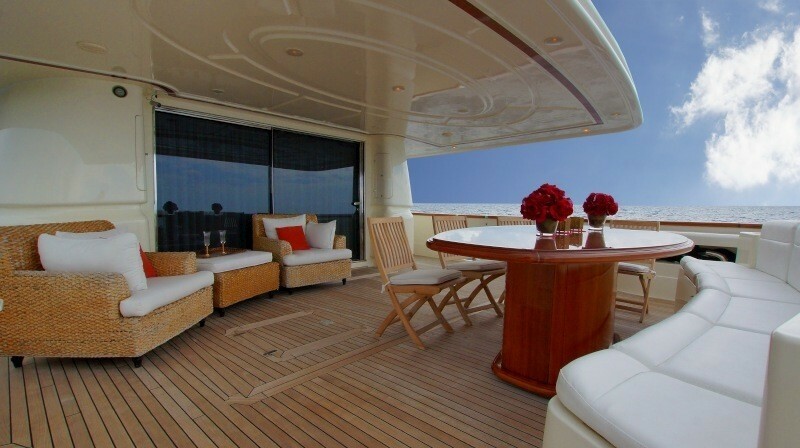 To the aft, sofas and armchairs are placed on the port side with a large coffee table to complete the conversational area. Opposite the aft seating, a staircase leads up to the bridge deck where a curving sofa is placed behind the helm station where guests can watch the action and enjoy forward views from the interior. The aft sky lounge receives plenty of natural light from the surrounding windows. A games table is placed in the centre of the room with a sofa on either side. A pair of MAN D2848 LE 8V 800 HP diesel turbocharged engines produce a top speed of 12 knots and a cruising speed of 9 knots with a range of 650 nautical miles. The accommodation sleeps up to 8 guests across 4 en-suite cabins: 1 Master suite, 1 VIP stateroom and 2 twin cabins. The crew of 3 will ensure that everyone on board receives first class service throughout the journey. 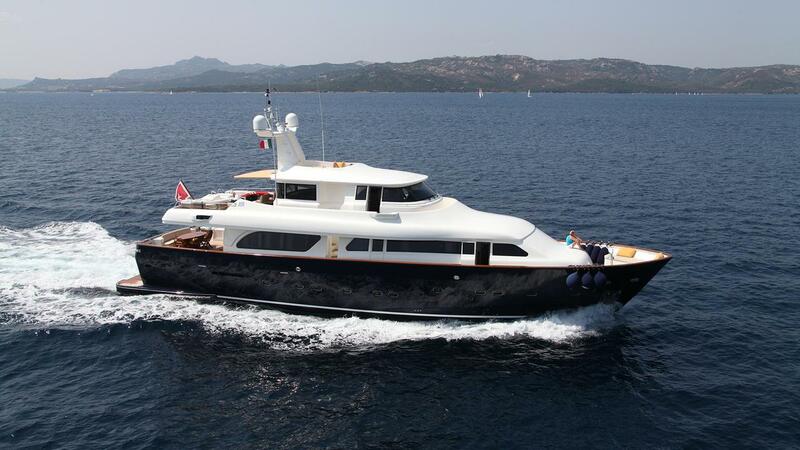 We do have available further amenity, owner and price information for the 27.30m (89' 7") yacht VINTAGE, so please enquire for more information.